Philip Steinberg is a Professor in the Department of Geography at Durham University, UK, a post he has held since autumn 2013, following 16 years in Florida State University’s Department of Geography. Prior to Florida State, he attended Clark University’s Graduate School of Geography (1990-1996), where he received his MA and PhD degrees, as well as teaching briefly in Bucknell University’s Department of Geography (1997). His research focuses on the historical, ongoing, and, at times, imaginary projection of social power onto spaces whose geophysical and geographic characteristics make them resistant to state territorialization. He has been an editor with Political Geography for five years. When our publisher at Elsevier first suggested that we conduct ‘speed reviews’ at major conferences, the Political Geography editorial team was skeptical. 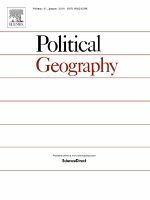 We assumed that most of our authors and prospective authors were familiar with Political Geography: After all, they had gotten through graduate school reading articles from the journal and we figured they must have a good sense of its content. What we hadn’t considered, though, was the value of giving the journal a human face. As editors, we establish relationships with our authors. Sometimes these are fleeting, hassle-free relationships and sometimes they’re long, drawn-out dramas. It’s understandable that authors want to have a sense of what they’re committing themselves to before submitting an article, especially when the odds suggest that their submission may well end up being rejected. Particularly wary are those prospective authors who are considering a jump between disciplines (or sub-disciplines) or publishing in a language in which they’re not accustomed to writing. I’ve found that most prospective authors who attend our speed review sessions come from outside the world of Anglo-American political geography that constitutes the journal’s historic author- and reader-base. The sessions usually take place at conferences with each individual slot lasting around 15 minutes, giving the author and the editor a short amount of time to discuss the paper and how it might fit with the journal. If you are interested in hosting speed reviews at an upcoming event, simply contact your publisher. Once you have decided on a suitable location, prospective authors will be alerted via marketing channels and can either pre-book their individual session or arrange attendance once they are onsite. Political Geography Editor-in-Chief John O’Loughlin has coined the term ‘speed dating’ for these speed review sessions and I think his renaming of the encounters makes sense. While these conversations do indeed provide opportunities for an editor to provide a preliminary review of a prospective author’s publication idea, the meeting is also, in a sense, one in which the editor and the author ‘check each other out’ in a safe, controlled, and time-limited environment. Each ‘date’ ends with the two sides awkwardly (and sometimes with an abundance of politeness) deciding whether it’s worth trying to take the relationship further. And, as on many speed dates, the answer is frequently “It was nice meeting you, but I don’t think we’re right for each other”. Of the 20 or so prospective authors I’ve met at these sessions, I believe that just one has submitted an article, plus another two or three were early stage graduate students who may submit pieces in the next few years. But this doesn’t mean that the speed review concept is a failure. In fact, it is just the opposite. As with more conventional speed dating, speed reviewing lets both authors and editors test the waters and, if necessary, reject each other with a minimum of heartbreak. Frequently when this happens, I’m able to give the author a steer toward another journal, or in some cases I’ve been able to pull out a nugget in the author’s presentation that, if adequately developed, could be of interest to Political Geography. As my fellow editors and I have found when desk-rejecting submissions, many authors appreciate a quick rejection instead of a long drawn-out process that has the same conclusion. And a pre-submission rejection is even quicker than a pre-review rejection. And then there are the cases where sparks fly between editor and author. Even in these cases, there’s no guarantee that ‘love at first sight’ will lead to publication (‘love at first cite’?). But an early conversation exploring where a proposed topic intersects with the journal’s remit can lead to a stronger initial submission. Whether the end result of a speed review is a quick rejection or eventual publication, the speed review process provides an efficient and enjoyable way for editors to meet both their contributors and their readers. I look forward to conducting them at conferences to come….and maybe some day I’ll find that perfect author who sets my editorial heart aflutter.